RÉSONAANCES: What's up at Susy's? 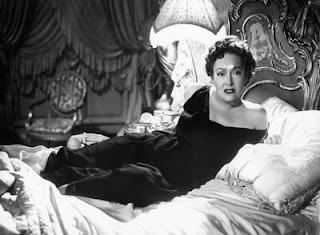 Remember Sunset Boulevard? An aging star (Susy) who fell from grace (after the LHC) ponders on her past glory, forgotten in a vast mansion (MSSM), attended only by her ex-lover (John Ellis)... Well, we are not exactly at that stage yet -- Susy is still found attractive and is being actively pursued by many. Actually, decadence fosters art: the subject of low energy supersymmetry has recently seen several interesting theoretical developments. I'd like to point out here the latest take on gauge mediated supersymmetry breaking. Susy predicts tons of new particles whose masses should not be larger than TeV. Although colliders have not yet probed the TeV scale directly, certain precise measurements at lower energies are in principle sensitive to the TeV scale. This is especially true for flavor violating processes, that is the ones that do not conserve generation quantum numbers such as (S)trangenes or (B)eauty. In the Standard Model, the amplitudes for all such processes can be predicted in terms of a few elements of the CKM matrix. Precise studies of the kaon mixing as well as the recent flood of experimental results from the B-factories have confirmed the Standard Model predictions leaving little room for new physics. New particles required by Susy generically violate the flavor symmetries of the Standard Model leading to new large contributions to flavor violating processes. The reason is that, in principle, the mass terms for squarks and slepton masses do not have to respect the approximate flavor symmetries of the Standard Model. In the half-empty approach that is very unfortunate and leads to the conclusion that there can be no Susy at the TeV scale. In the half-full approach that is fortunate as it gives us a clue as to how the supersymmetric particles are organized. The flavor problem strongly hints that something like gauge mediated supersymmetry breaking is at work. Gauge mediated supersymmetry breaking, proposed back in the early eighties, is a scheme designed to overcome the Susy flavor problem. It assumes that the masses of squarks and sleptons are produced in 3 steps. First, there is a dark sector somewhere out there, in which supersymmetry is broken, perhaps dynamically. Second, there exists a set of fields, called the messengers, who communicate between the dark sector and the MSSM. The messengers couple to the dark sector and directly experience the supersymmetry breaking, so that the masses of the messenger fermions and scalars are different. At the same time, the messengers also couple to the MSSM gauginos and gauge bosons, because they are charged under the Standard Model color and electroweak group. Thanks to that, in the last step supersymmetry breaking masses for the squarks and the sleptons are generated via loop diagrams involving the messenger fields. 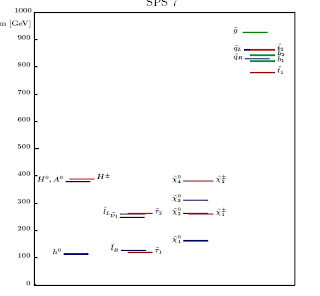 Because gauge interactions are flavor blind - gauge bosons couple in the same way to all three generation - the squark and slepton masses end up being approximately diagonal in the generation space. A diagonal matrix does not break any symmetries - approximate flavor symmetries of the Standard Model are protected. The world is saved again. Many of you might be familiar with the minimal gauge mediation model. That model introduces very few free parameters: the scale of gauge mediation and the number of messengers (and some more parameters in the Higgs sector) and for this reason it makes sharp predictions. The most spectacular prediction is that the gravitino is the lightest supersymmetric particle to which all other superparticles ultimately decay. On top of that, minimal gauge mediation predicts specific mass relations among gauginos, squarks, and sleptons. Minimal models are extremely important from the sociological point of view because they facilitate plotting exclusion limits, which has been the main activity in particle physics in the last 30 years. At the cognitive level, however, it is interesting to know if gauge mediation makes general predictions that are independent of the particular model of messengers. That's quite relevant for the LHC who should be prepared for all sensible scenarios. There are also theoretical reasons to go beyond the minimal model, as some of its mass relations are troublesome. In particular, the fact that the stop squark is heavier than the lightest slepton by almost a factor of 10 leads to a large fine-tuning undermining the very motivation for supersymmetry. There has been of course a lot on non-minimal models proposed in the last decades. But only one year ago the paper entitled General Gauge Mediation made an attempt to systematize all consistent realizations of that scheme. It turns out, perhaps unsurprisingly, that the mass relations between superparticles can be completely altered in general gauge mediation. There are however two sum rules for superparticle masses that remain true independently of all detail and, ultimately, these sum rules should allow us to distinguish gauge mediation from other models of supersymmetry breaking. Phenomenological consequences of general gauge mediation are just beginning to be explored, see here for example. The general formulation can be extended to the supersymmetry breaking parameters in the Higgs sector. If gauge mediation is discovered, we will have invent completely new mechanisms for moduli stabilization such that the gravitino mass and the moduli masses are completely decoupled. Such a task will be quite challenging! solutions offered to the B-mu problem are quite contrived. SUSY-breaking and the origin of moduli fixing are unrelated. three different generations is the same (e.g. same brane sector). to break SUSY, as hapens in gauge mediation. I guess the true statement is that as long you remain in the context of effective field theory then gauge mediation is almost the only way out for Susy. Yes, it's not pretty, it's ad-hoc, it's contrived, you have to solve the mu-Bmu problem and so on (I make fun of Susy for exactly these reasons and more). Nevertheless, withing this scheme one can at least write a complete working model, including Susy and flavor breaking. If one allows for non-field-theoretical UV completions like string theory then there may be another explanation why non-protected flavor-violating operators allowed by all symmetries do not appear in the lagrangian. But in this case, I believe, a complete model is yet to be devised. I don't quite get your statement that as long as we remain in effective field theory gauge mediation is the only way out. Supergravity is effective field theory as well, no?, and gravity mediation is no deeper than using supergravity rather than global susy. And the stringy solutions to the so-called flavour problem can be cast almost fully in EFT language: as long as the N=1 theory descends from N=2 susy and inherits its structure, you decouple hyper and vector multiplets - the one sources flavour and the other susy breaking, and bing go your dangerous operators. In any case: the CP violating observables are also extremely severe and in gauge mediation there is no general reason why these are protected (as the papers you refer to acknowledge). So the prime selling point of gauge mediation seems more than a trifle selective: it protects against all unwanted operators except the ones it doesn't protect against. Supergravity is an effective field theory, precisely. It has a cutoff at Mplanck. Therefore, according to the rules of effective theory, one should include all higher dimensional operators that are consistent with the symmetries of the effective theory, and these higher dimensional operators should be suppressed powers of the cutoff Mplanck. That would lead to excesssive flavor violation via the operators of the form Q_i*Q_j X*X/Mplanck^2. Thus, supergravity does not makes sense as an effective theory approach to supersymmetry breaking. One has to assume that the problem is solved by the UV completion of supergravity, which by definition cannot be a field theory. That's what I meant by saying that, within the context of effective field theory, gauge mediation is the only way out of the Susy flavor problem. Don't get me wrong: gauge mediation stinks as well. CP is another problem one has to address. I'm only arguing which of the two approaches is more unlikely, but the entire concept of low energy Susy is utterly unlikely from the outset. Gauge mediation at least offers tools to address the (mounting) problems. much of what we often see on the archives!! !